On Saturday morning, T, George, and I all hopped in the car and headed to Asheville for the day. We've never taken a day trip to Asheville before, but it's only an hour down the road. Not sure why we haven't ever done this before- it was such a blast! We arrived just in time for lunch, and stopped at a place called Rocky's Hot Chicken Shack. 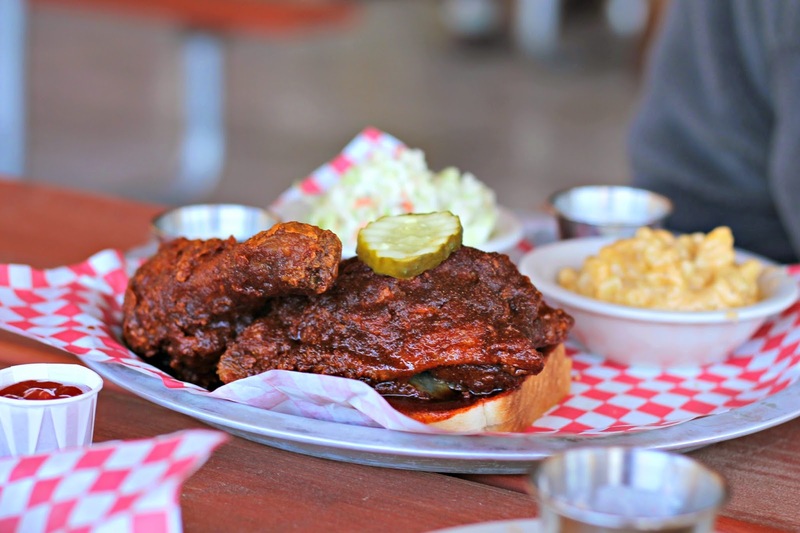 T and I first fell in love with Tennessee-style hot chicken on our first year anniversary trip when we happened upon a place called Hattie B's. We later tried out the recipe ourselves when we hosted supper club, and were very pleased with the results. 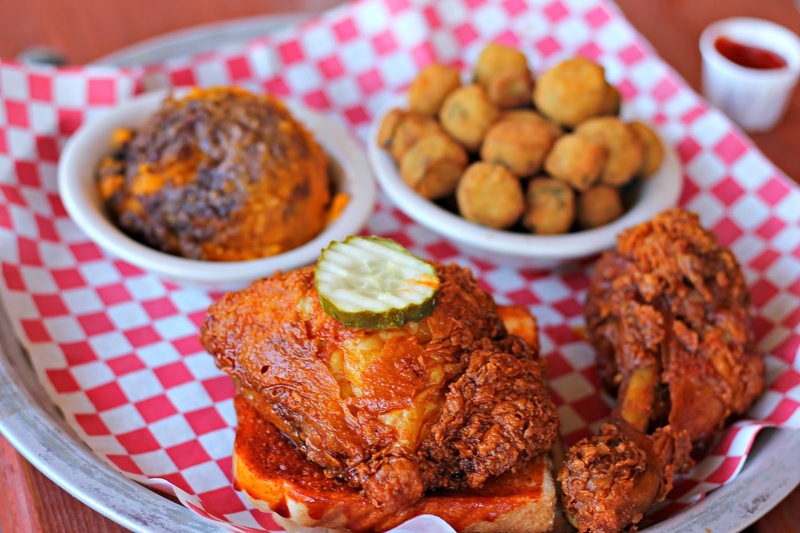 When we found out Asheville had a Tennessee-style hot chicken restaurant, we just had to go. This place is also number one on Urbanspoon's current Talk of the Town list, so apparently we weren't the only ones dying to try it out. 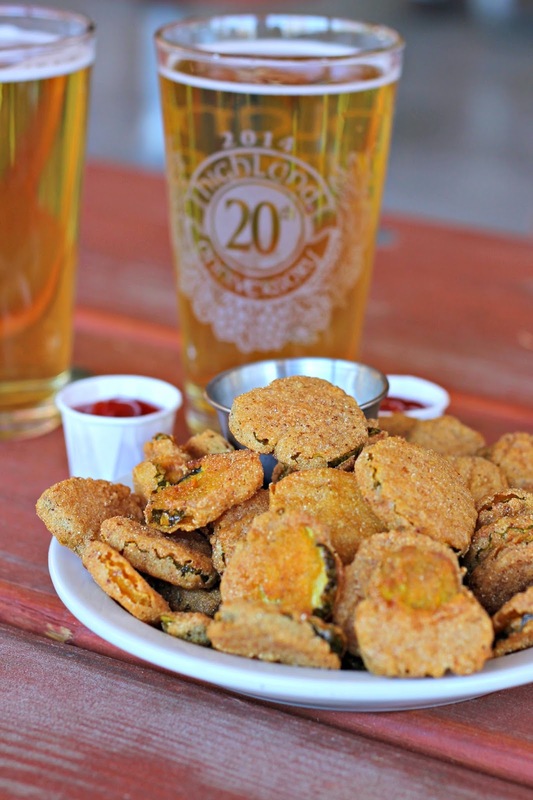 We were starving when we arrived, so we started with an order of fried pickles and two PBRs. Rocky's also has a wide selection of microbrews, but the combination of hot chicken and a cold PBR sounded pretty enticing that day. I ordered a leg and a thigh plate with fried okra and sweet potato casserole. Once you pick your kind of meat, you then choose your heat level. At Rocky's "mild" doesn't necessarily mean mild, it's still got some heat to it. T went with the medium heat level, and I went of the Mildeum, a mix between mild and medium. Just as we expected, T's was more like a hot heat level, and mine was like a medium-hot. For his sides, T ordered mac and cheese, and slaw. All four of our sides were amazing, but we quickly realized we ordered way too much food. As usual, our eyes were bigger than our stomachs. We could have easily ordered two sides to share, and I would have been good with just one piece of chicken. Regardless of our over ordering, we were very pleased with everything Rocky's had to offer. 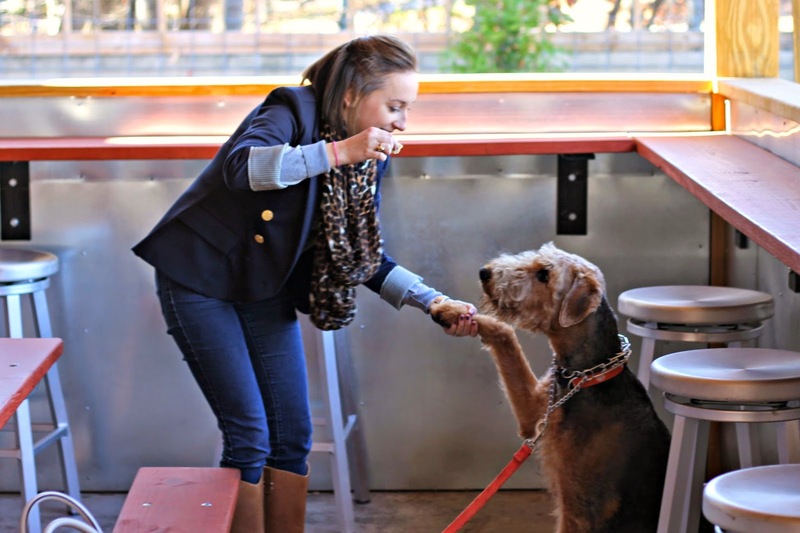 A fun ambiance, friendly staff, great food, and a dog friendly porch. George even got to enjoy a taste of their yummy chicken, with the spicy parts taken off, of course. Our next stop was downtown Asheville to do some walking around. Once we felt like we worked off a bit of our lunch we plopped down at one of the outdoor tables at Jack Of The Wood, a Celtic style pub that's home to Green Man Brewing. We sipped on our beers, and did some people watching as we listened to the oldies music of the radio station next door. The DJ was broadcasting live right out of the window front, and they had big speakers set out on the sidewalk so everyone could hear. 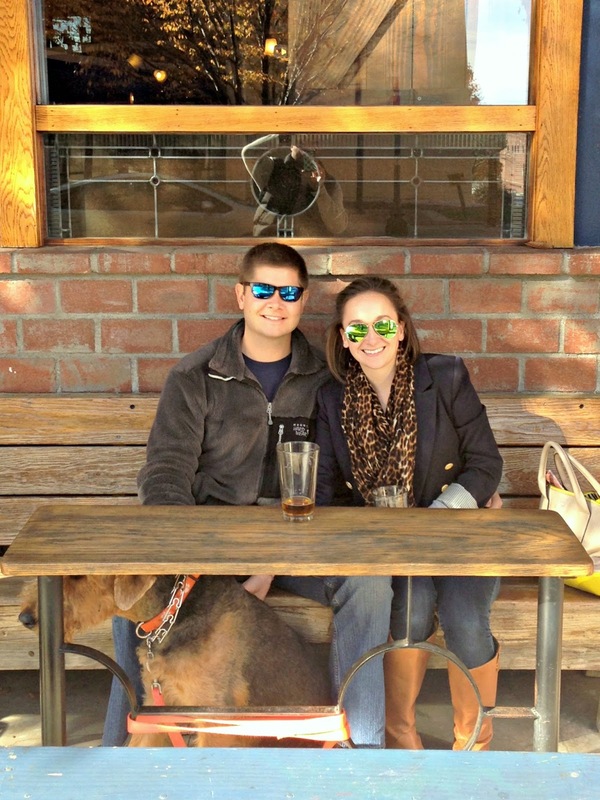 After our beer at Jack Of The Wood, we headed to Wicked Weed Brewing, and sat out on their front patio which is also dog friendly. They even had dog bowls out and a spigot for dog water that looked just like a beer tap. Wicked Weed's prices for beers were great. They offered both 10 oz and 16 oz pours of their beers. I ordered the 10 oz Reticent Saison for a whopping $2.50, and T tried the 10 oz Old Fashioned, an ale brewed with cherries and orange zest and aged in whiskey barrels. I wish we were hungry, because the food all around us looked scrumptious. Once the temperatures started to drop, we decided it was time to head back home. An hour later we were back in our neighborhood sitting around a fire with our neighbors watching football, and George was fast asleep. We both agreed than an Asheville trip needs to be a yearly tradition, and this year we couldn't have picked a better time to go. The air was crisp and chilly, and the leaves were absolutely beautiful, such a perfect time to be in the mountains! Your weekend looked wonderful and so did that chicken! Great post!! We're definitely hitting up Wicked Weed, Theo won't stop talking about it, and Jack of the Wood sounds great too! Glad all these places are dog friendly! We're going early December so my only worry is it might be snowing! What kind of dog is George? He's so cool! 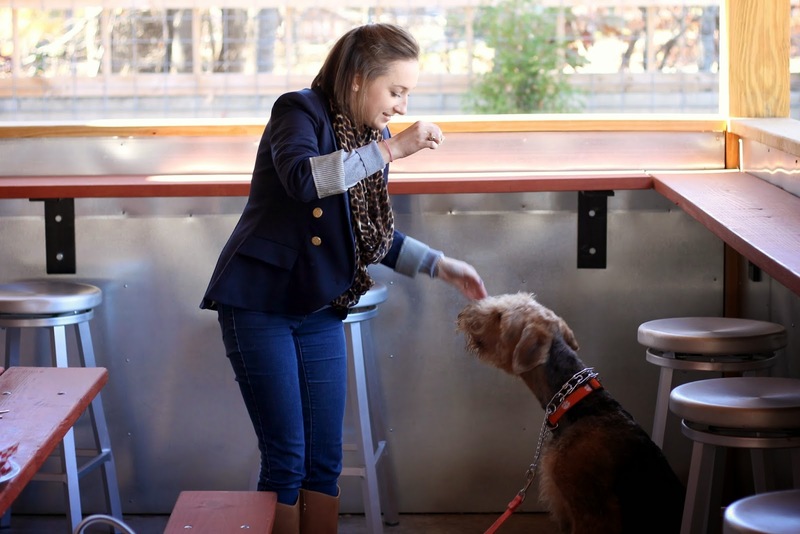 I love hearing about new asheville spots since my grandma lives there. sounds like an awesome day! I love how close you guys are at Asheville. It's a favorite spot to head to for us, but not an hour away. Adding these places to our to-visit list for next time! How much fun!! I've been wanting to do a day trip to Asheville and this definitely made me want to go even more! 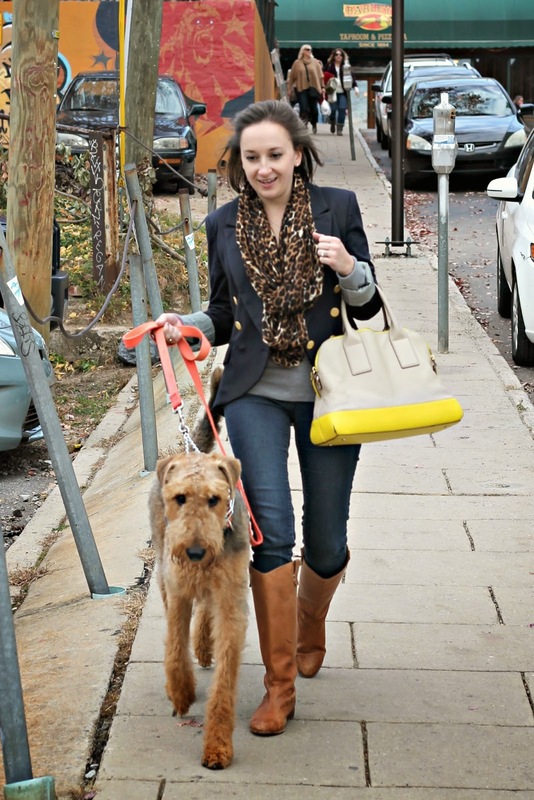 We would want to bring our pup too- I love that there are several pet friendly places there. 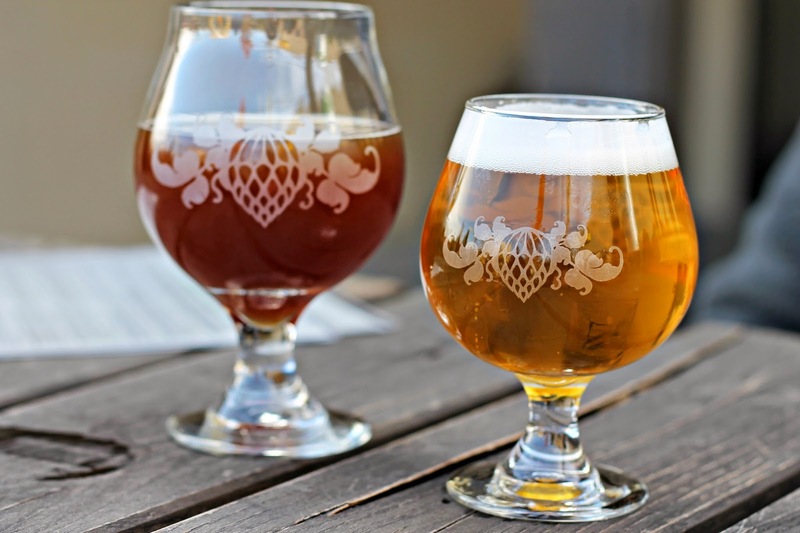 I've heard good things about Wicked Weed, we'll definitely have to try it out once we make it up there! It sounds like you had a fun day trip to Asheville. 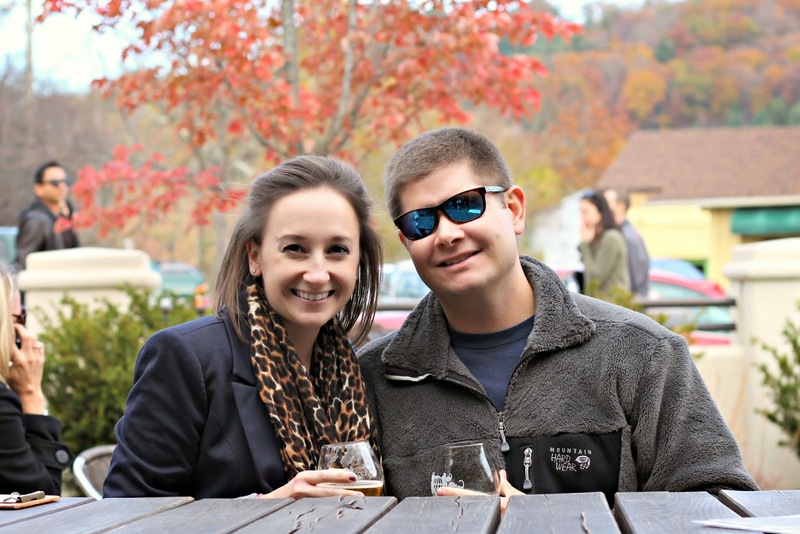 I was recently there for a 3 day weekend with one of my best friends, and we had a blast walking around and exploring (Wicked Weed is one of my favorite Asheville spots). Thanks for the new recommendations, I will have to try Rocky's next time I'm there!